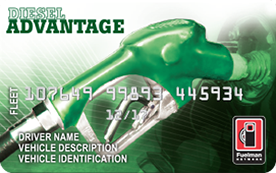 The Diesel Advantage Fleet Card is the choice for heavy-diesel users with fleets of all sizes. Diesel fleet managers who want controls and wholesale-based pricing on diesel fuel can save up to 15¢ per gallon at over 50,000 fuel and 20,000 retail locations in the Fuelman Network and gain more control over diesel fleet expenses. Drive your diesel fleet with confidence knowing expenses are more controlled and less incidental. Customize purchase limits by type of fuel, time, date and gallons, and monitor driver activity to minimize unwanted fleet expenses. Reduce fraud with real-time text and email alerts on unusual transactions. The world is moving digital, so why shouldn’t your diesel fleet? Besides fueling and maintenance, diesel fleet managers can enroll in automated tax reporting for off-road diesel and IFTA filing purposes, while identifying convenient service locations all online. *Wholesale cost calculated as cost of fuel plus a small margin to cover freight and transaction fees. Actual savings vary based on the wholesale and retail price of fuel in the market. Customer's price will never be below Fuelman's cost paid to merchant. Program pricing is reevaluated annually and subject to change thereafter. Walmart and Sam's Club transactions priced at credit retail. Transactions at Arco are subject to special pricing.